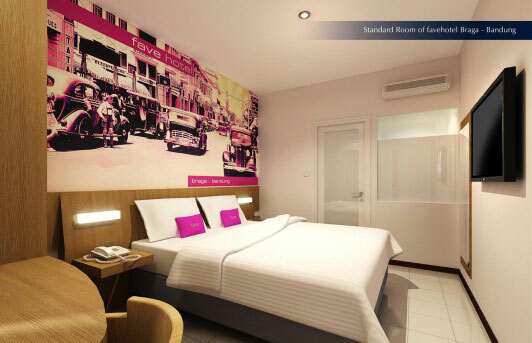 Jakarta, October 9th, 2012 – With the opening of the favehotel Braga – Bandung, Aston International brings a trendy, ultra modern and hip select service hotel to the historic heart of Bandung. The favehotel Braga – Bandung sits in a supreme location in the heart of Bandung’s historic center on Jalan Braga, surrounded by an abundance of nearby night clubs, chic cafes, boutiques and restaurants and is connected to the Braga City Walk Mall and the Aston Braga Hotel & Residence bringing a wide range of shopping, entertaining and recreational facilities to the hotels front door. The new favehotel, which is the 14th to open in Indonesia and the 2nd in Bandung, features 150 modern and functional rooms and a range of facilities and services usually found in more up-market hotels such as meeting rooms, an eclectic coffee shop and free high speed WiFi. Each room features the fave trademark design and is edgy, crisp and while basic does present large LED TVs with a wide choice of local and international channels, top quality beds and cotton bed linens and safe deposit boxes. Bathrooms are functional and offer standing showers and a full range of amenities. Aston International’s Vice President of Sales & Marketing, Mr. Norbert Vas, said: “Consistent with our favehotel concept, the favehotel Braga occupies a prime location, is functional and inexpensive yet fun, fresh and friendly, beats many 4 and 5 star hotels in areas such as WiFi speed and beddings and is runes by a dedicated and enthusiastic team that enjoys giving good service”. Seen in the image, ribbon cutting as an official sign of Soft Opening favehotel Braga – Bandung by Mr. Tjen Rudy Chandra (right) – Director of PT. Bangun Mitra Mandiri (Owning Company of favehotel Braga – Bandung) and Mr. John Flood (left) – President & CEO Aston International. favehotels currently operates fourteenth (14) hotels in Indonesia and Malaysia and has a large development pipeline counting more than fifty (50) hotels. favehotels aims to be SE Asia’s best in class and most consistent budget hotel chain promising uncompromising standards for cleanliness and safety and select hallmark services and facilities including top of the line beddings, an industry leading website and booking engine guaranteeing best rates for direct clients and fast and complimentary Wi-Fi. Aston International entered Southeast Asia over a decade ago and has since become a prominent international player in the Indonesian hotel market, with offices in Bali, Jakarta and Surabaya. Aston currently operates in Indonesia, Malaysia and the Philippines under the five-star Grand Aston and Crimson, deluxe villa Royal Kamuela and Kamuela, four-star Aston, three star Aston City, Quest and Neo , boutique budget class Neo hotels and select service favehotel labels.